Its been a while since the last E*Speed update, but that means that I have been busy logging many electric miles during that time. The durability of the motorcycle has been amazing, epically considering this machine was completely hand built as a one of a kind “test mule” electric motorcycle. I had a set-screw come loose on the shaft coupler that connected the twin motor shafts together, luckily it was easily remedied with some shaft re-surfacing and using “loctite” thread adhesive to prevent it from coming loose again. I decided to experiment with a new (single) Mars motor, the “1003 double brush” 500A motor, this was not because of any problem with the twin motor setup, but because the 1003 motor was not available before. The upgrade made the motorcycle slightly lighter and provided more low end torque, I decided to keep it this way because of the improved weight, aerodynamics, and simplicity. At 483 miles– Current total mileage, with no problems to report! 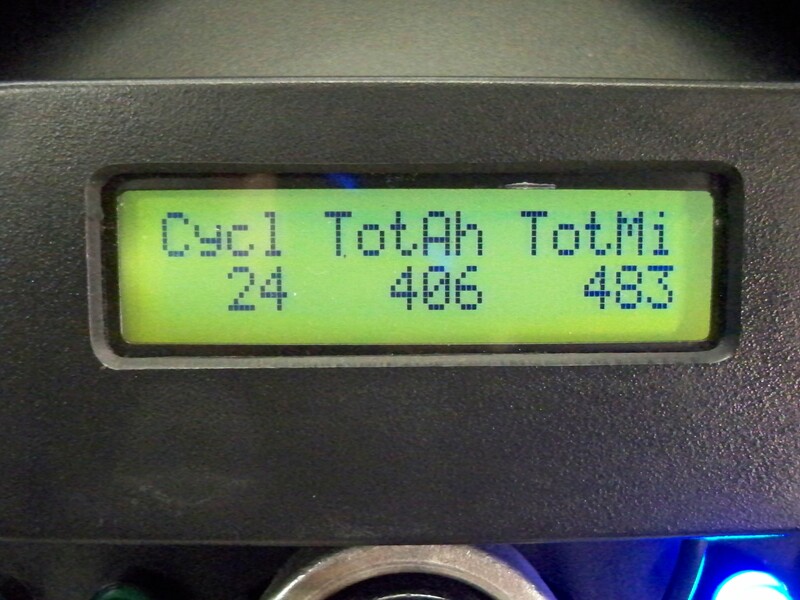 The cycle analyst also records how many times you have charged the battery, I have 24 charge cycles on my Batteries. This can be rounded to the figure of 50 charge cycles per 1000 miles. The expected life of the Thunder Sky Lithium batteries is 4,000 cycles @ 70% dod (depth of discharge) Meaning the batteries will be 70% as effective as when they were new. If I calculate my real world results of 50 cycles per 1000 miles, this would give the battery pack a calculated 80,000 mile life! Even if it was 3/4 of this figure (60,000 miles) that would be more miles then I have ever seen on a motorcycle. 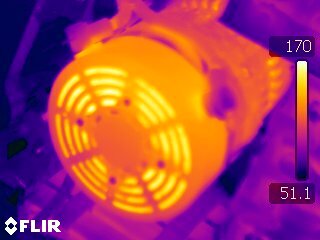 Thanks to My Brother who has accesses to a very nice (and expensive) thermal camera, we were able to look at the thermal images to ensure proper cooling of the battery, motor, and controller. This information is very helpful to prevent hot spots on the large battery pack. Unknown hot spots on any of the parts could cause pre-mature failure or wear. The Motorcycle has been a blast to drive, and I am always excited to see where I take it next! The only “on-going” issue I would like to work out is better thermal management of the batteries in cold weather. I have noticed in very cold weather (30~45 degrees F) the battery does not push as many amps in the first 10 minutes of driving, but once the battery has operated for 10 minutes, it is warmed up and operates like normal. 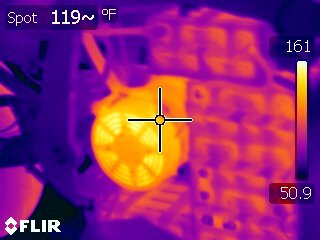 I am thinking of adding thin resistance heaters (similar to the heat pads used to help sore muscles) between the cells that would be wired to the charger therefore keeping the batteries at their optimal temperature. 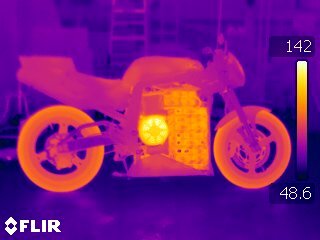 A circuit would activate this heater below a certain ambient temperature threshold to conserve energy, and they would only operate when the motorcycle is plugged in, since cold temperatures only effect it during the first minutes of driving. Otherwise in temps above 45 degrees they have performed fantastic!